This building on the east side of St Andrew’s Square is Dundas House, a Palladian villa designed by the Swedish- born Scottish architect Sir William Chambers (1723 – 1796). Built from 1772 to 1774 as a private mansion for Sir Laurence Dundas (1712 – 1781) a wealthy entrepreneur and Member of Parliament for Edinburgh, the site for the building had originally been planned to be the site of St Andrew’s Church. Dundas however scuppered the plans of both architect James Craig (1774 – 1795) and the city fathers and purchased the site on which to have his home built. His luck was not always so fortunate however as shortly after he took up residence, he almost lost his new home in a game of cards. 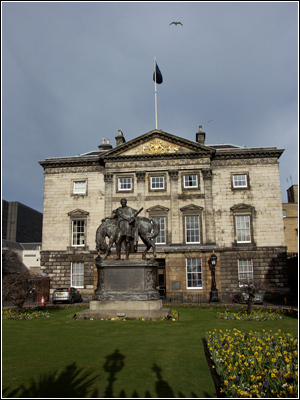 After his death, Dundas’s son Thomas sold the property to the government and the building became as Excise Office until it was sold again in 1825 to the Royal Bank of Scotland, where it served as bank headquarters until 2005.